“I just go along with the flow,” said the 66-year-old in the interview, slouched, foot playing with the penny board on which he arrived. “Some Republicans just don’t get it. I know that’s been a frustration for people your age, and I want you to know I do. I really get it. I don’t buy what the Republican Party has become. I’m not just some eyes-closed old Boomer who isn’t in touch with the changing times. I know dope has some positive medicinal qualities, and I know it’s time for common-sense gun control." 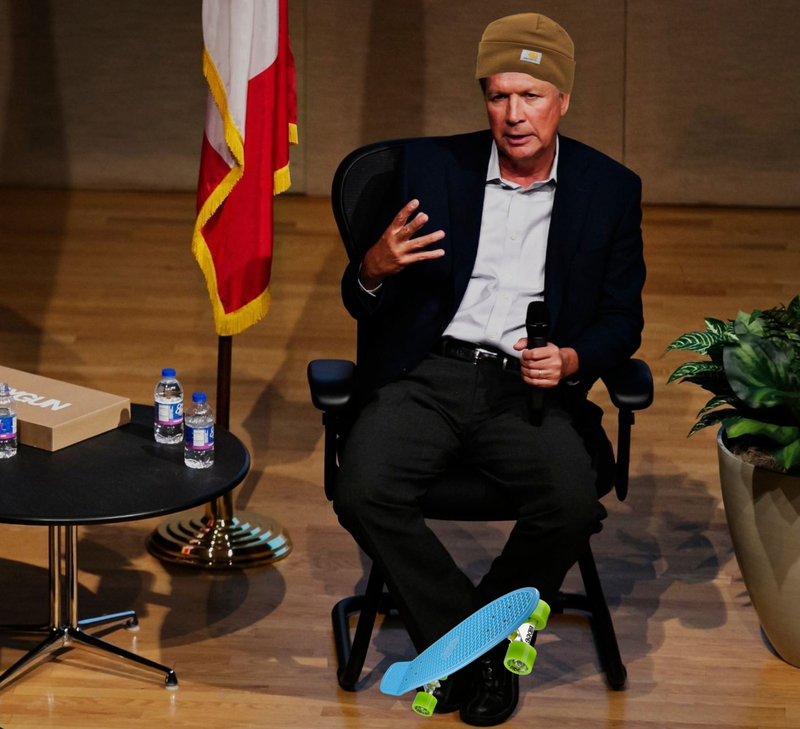 Kasich coolly adjusted his Carhartt cap and popped some Ketamine before continuing. During this statement, Kasich’s right forefinger momentarily met his right thumb, and his hand rhythmically shook for about three seconds. Kasich seemed to notice the evidence of his political conditioning, however, and quickly folded his hands across his lap, with what seemed to be slight worry over appearing “too establishment” furrowing his brow. Following the misstep, the Governor hastily pulled a Juul out of his pocket, quick to reconnect to the youth. “Love this stuff,” said Kasich after a couple of puffs. When pressed on his candidacy in the 2020 election, Kasich quickly replied, “No, no. This isn’t about that. This isn’t a game. I wouldn’t play you like that. I’m just trying to do my job as best as I can. And what comes will come … are you feeling me?” To punctuate this sentiment, Kasich languidly tipped back his chair and eyes closed, blew “cotton candy” vapor into the ceiling space above. Governor Kasich closed the interview in a four-minute coughing fit and an abrupt bang when the front two legs of his chair slammed to the floor.